A dental implant is a medical device known as a “fixture” which is placed into bone in order to support a prosthetic replacement for a tooth (and at times other body parts). In this manner, an implant simulates the root of a natural tooth. 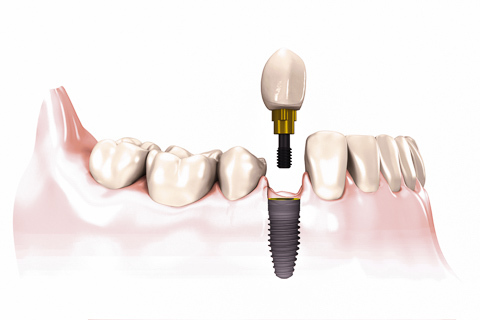 However, unlike a natural tooth root, in the case of modern implants this fixture is maintained in the bone by a process known as osseointegration. 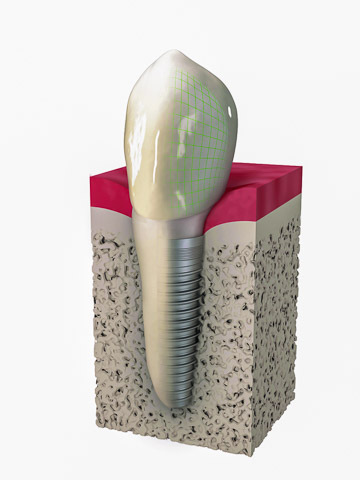 A natural root is held in the bone by a soft tissue ligament, but an implant is retained by direct contact of the bone to the surface of the fixture.This direct contact is defined as osseointegration. Dental implants are not new in concept. For thousands of years, humans have experimented with implanting fixtures into the jaws to replace teeth. Most of these efforts were not effective, but some of these experiments were able to achieve some degree of success in limited cases. 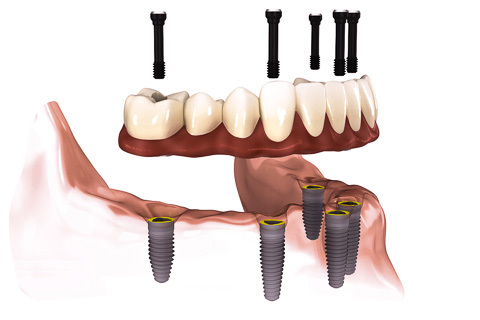 Until the discovery of surgical techniques and implant materials favorable to osseointegration, none were predictable. 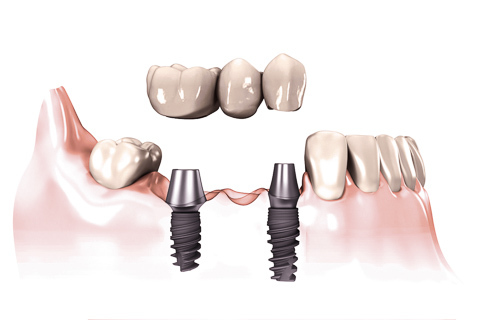 Implant materials and technologies are constantly evolving, and at the present a general success rate of about 95% is commonly reported. 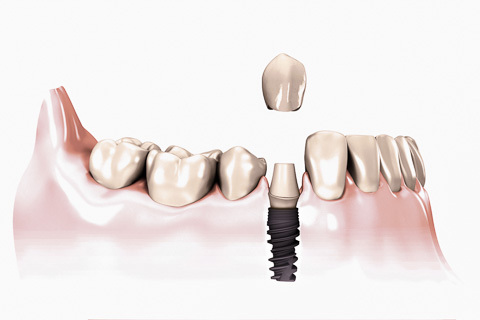 Not everyone who is missing a tooth or teeth is a candidate for dental implants. 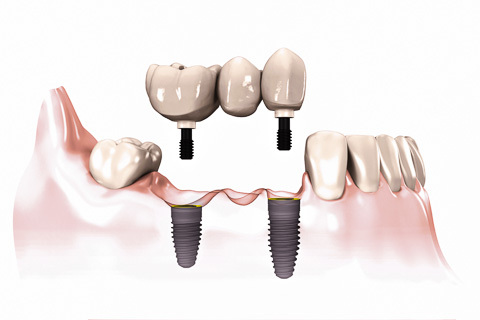 Many factors come into play in deciding who will benefit from dental implants. General health is a very important factor. Certain systemic illnesses, medications, radiation, osteoporosis treatments, cancer treatments and prior medical history may compromise the success of implants. Dental health, such as gum disease, is another factor which plays an important role. Personal habits, such as smoking, hygiene, use of tobacco, drugs and/or alcohol, are also very important considerations. What other factors are important? Beyond these general considerations, local factors also determine who could be a good candidate to benefit from dental implants. In order to succeed an implant needs to be placed into a sufficient quantity of bone of a certain adequate quality by a properly trained and experienced doctor. The volume of bone must be sufficient in all three dimensions. Unfortunately, after teeth are lost, the bone which held them is eventually reabsorbed by the body, in a sort of biological economizing; a form of “use it or lose it.” Thus, for many, when a long time has passed between the loss of the tooth and the desire for implants not enough volume is left to support an implant. Other considerations which influence the bone volume available are the position and size of the maxillary sinus in the upper jaw and the position of the canal in the lower jaw which carries the principal nerve for the lower jaw. The space available between adjacent teeth, between the jaws and to either side of the planned implant, also influences the volume of bone available for an implant. The quality of the bone is also very important. The bone must be sufficiently dense to provide the implant with a degree of initial stability in order to allow for healing. This bone must also be free from compromising factors and be capable of optimal healing potential in order to allow for the requisite direct contact to the fixture. Are there solutions for these cases? Fortunately for some, there are ways to correct some of these problems. 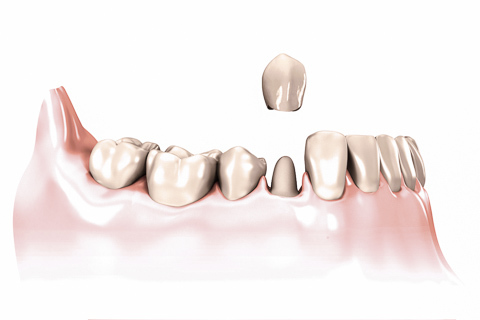 Bone grafting is a very successful method of increasing bone volume when space is available. Currently, many materials are available for reconstruction via bone grafting. Bone is the usual preferred material and may be obtained from the patient’s own body, from a tissue bank or from other non-human or synthetic sources. For some patients, orthodontic treatment, or “braces,” may be an option for creating more space to allow for implant placement. For others, the sinus and or nerve may be surgically removed out of the way of a planned implant. Often, these procedures are performed in conjunction with bone grafting. 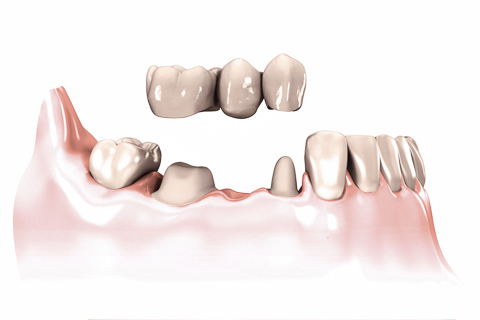 There are also advanced techniques and implant systems designed for more complex cases. Always, as with any surgical procedure, there are options. In the case of a missing tooth or of missing teeth there are several options. The simplest option may be to do nothing. For example, usually this is the recommendation when only the wisdom teeth are missing. Other options could be a removable complete or partial denture or a fixed bridge. Are there risks associated with dental implants? A dental implant is a foreign object by nature. As such risks of rejection are always possible. Modern implants are most often made of surgical grade titanium which is a very inert material which is very well tolerated by the body. This inertness of the implant fixture is what makes osseointegration possible. An implant is placed into the bone via a surgical procedure, thus it also carries risks associated with the surgery. These may include pain, swelling, discomfort opening the mouth, bruising, infection, bleeding, sinus and nerve complications, damage to nearby teeth. Long term complications are also possible. Because implants are metallic in nature they are immune to dental caries or decay. However, even though an implant is made of a tough “space age” material such as titanium, by being placed into the mouth it can be susceptible as are the natural teeth to forms of gum disease. This is called “periimplantitis” in the case of implants. All materials can ultimately fail as can implants, but many reports have shown that the prosthetic components will more likely require replacement before the implant, as will conventional dentures, crowns and bridges. Many implants are still functioning decades after having been placed. Copyright © 2001-2015 Carlos J. Rodríguez-Feo, DDS, PA. All Rights Reserved.